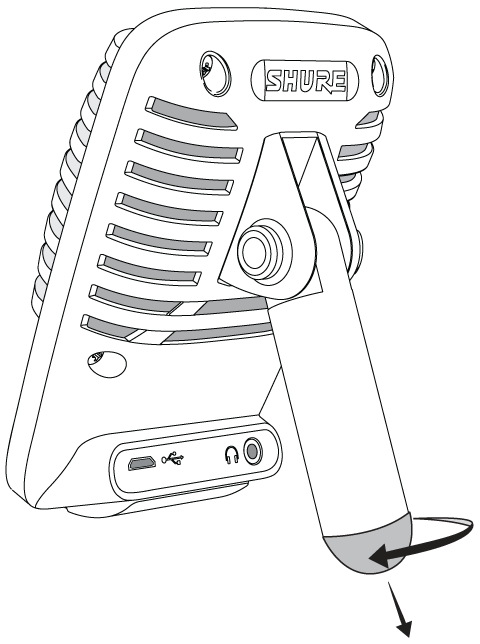 The Shure MV51 is a professional-quality USB condenser microphone, ideal for home recording, podcasting, and video conferencing. The attractive and durable all-metal design features an adjustable kickstand for desktop use, and can also mount onto a microphone stand. A touch panel user interface provides control of microphone gain, headphone level, application modes, and muting. 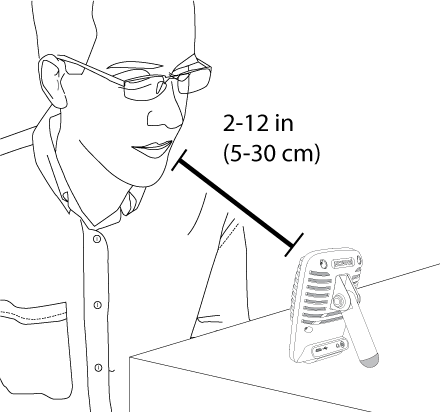 Aim the microphone towards the sound source by adjusting the kickstand. Unscrew the end cap to thread the kickstand onto a standard 5/8" microphone stand. The MV51 is compatible with most devices that have a USB or Lightning connector. Connect the microphone to a computer or mobile device. Use the appropriate cable (USB or Lightning). Drivers will be installed automatically. The touch panel illuminates to indicate a successful connection. Open the sound control panel. Select the Shure MV51 driver. Raise the level on both the MV51 product and the host computer for proper monitoring. Confirm that the MV51 is the selected audio device. Plug headphones into the MV51 device audio output and play an audio track. If you can hear sound, the microphone is functioning properly. 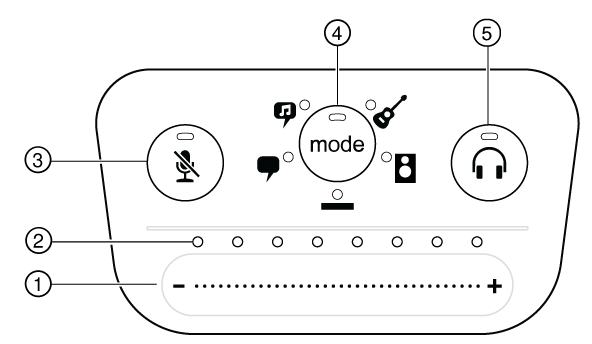 If your computer settings default to another device, open the sound control panel and select the MV51 device. 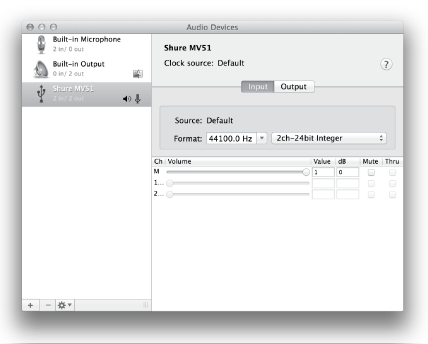 Adjust the headphone volume on the Shure MV51 device driver. Open the MV51 driver from the sound control panel and raise the headphone volume from the playback or output tab. Use the MODE button to select the preset mode that fits your application. If the audio is too quiet or causes distortion, adjust the gain manually. Refer to the "Adjusting Microphone Level" topic in this guide for more details. In your recording application, select the MV51 as the input source. See your software user guide for information on assigning input sources. You are ready to record. Adjust microphone or headphone level by sliding your finger across the control surface. Press the mode button to activate microphone level. Press the headphone button to activate headphone volume. Displays microphone and headphone level. The LED color indicates the level being displayed or adjusted. Press to mute and unmute the microphone. Press to select preset mode. Press to select headphone level controls (orange LED bar). Then use the volume control slider to adjust headphone level. Press again to return to microphone level display (green LED bar). Five selectable modes optimize settings for equalization and compression to match your recording needs. Set your volume level and scroll through the modes to find which setting sounds best. The preset settings will not affect the microphone level. A completely unprocessed signal (no equalization or compression settings used). Use when processing the audio after recording. This section suggests microphone placement for typical use cases. Keep in mind that there are many effective ways to record a given source. Experiment with the following microphone placement and settings to find what works best. Set the microphone to the Speech mode. Speak directly into the front of the microphone at a distance of 2-12 inches (5-30 cm) away. Speaking closer to the microphone results in more bass response, similar to voices on a radio broadcast. Make additional gain adjustments if necessary. To capture acoustic sources, such as singing, acoustic guitar, soft percussion, or other musical instruments, use a close microphone placement. Aim the microphone directly at the sound source. For a single source, such as a string instrument or a vocalist, place the microphone 6 to 12 inches (15 to 30 cm) away. 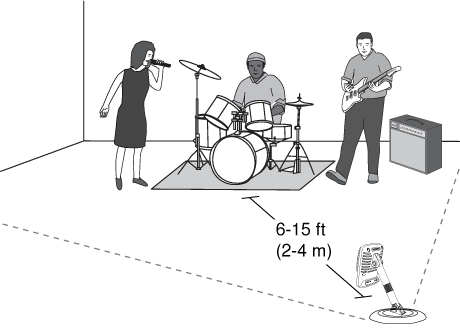 For a small group or a performer who is singing and playing an instrument simultaneously, use a distance of 2 to 10 feet (0.6m to 3 m). Placing the microphone farther away results in more ambient room sound. Set the microphone to the Acoustic or Singing mode and make additional gain adjustments if necessary. To record a band with drums or amplified instruments, aim the microphone towards the group at a distance of 6 to 15 feet (1.8 to 4.6 m). Placement of the microphone depends on the size of the room, number of people, and instrument volume. If possible, walk around the room and listen to find where it sounds best. 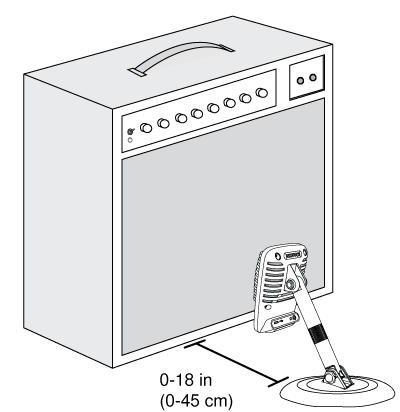 For other loud sources, such as an electric guitar amplifier, aim the microphone at the sound source from 0-18 inches (0-45 cm) away. Set the microphone to the Band mode and make additional gain adjustments if necessary. To record a signal without any processing, set the microphone to the Flat mode. This mode is appropriate for any application when you want to bypass equalization and compression presets, and is ideal when applying signal processing to the recording at a later time. Shure offers additional educational publications on recording techniques for specific instruments and applications. Visit shure.com for more information. Select the correct preset mode for your recording application. If you hear distortion or the audio is too low, adjust the microphone level in the audio or sound control panel of your computer or recording device. Set the microphone level before adjusting headphone volume. The headphone volume does not affect the signal level sent to the computer. Use the volume slider on the front panel to adjust the microphone gain level. Note: The microphone gain control is independent of the preset modes. Set your microphone level and experiment with dynamic processing options via the preset modes. 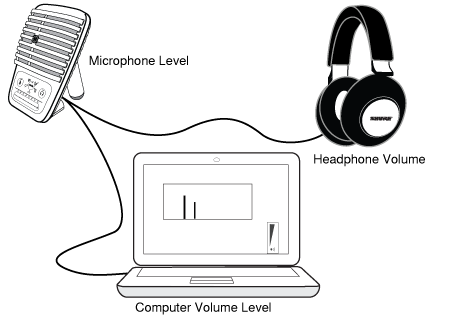 The headphone monitoring level is affected by the MV51 device level and the computer settings level. Raise your computer volume up and easily adjust headphones through the MV51 device headphone settings. Open the sound control panel and select the Recording tab. Open the Shure MV51 device. Under the Levels tab, adjust the gain level using the slider. Open the Audio Midi Settings panel. Select the Shure MV51 device. Click on Input to adjust the gain using the slider. If your digital audio workstation or recording software has input meters, adjust the microphone level so it peaks between -12 and -6 dB. Otherwise, simply listen to the audio to make sure it is loud enough and not distorting. 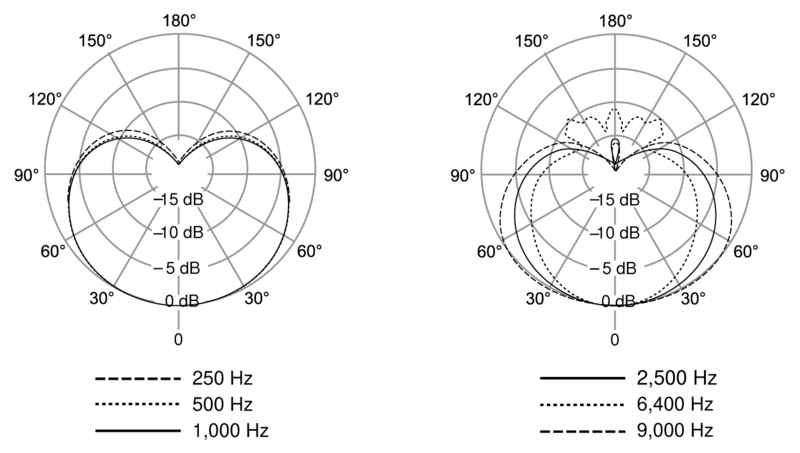 The target range for peak levels on a typical meter is between -12 and -6 dB. The headphone output provides an equal blend of the direct microphone signal and audio playback from the computer. This allows you to conveniently adjust the overall headphone volume with one control on the device touch panel. To change the playback audio level relative to the direct microphone signal level, adjust the computer or DAW mixer settings. Tip: When first connecting the microphone to your computer, make sure to raise the volume level in the sound control panel of the computer for a strong audio signal. Then adjust headphone level on the device for comfortable monitoring. Sample Rate and Bit Depth settings are found in a drop down menu in the audio or sound control panel of your computer. You can adjust these variables to fit your needs. Select a lower sample rate for podcast recording, when it is important to have a smaller file for easy download. Select a higher sample rate for music and more dynamic recordings. Tip: Record at a higher sample rate and bounce down to an M4A for a file with the highest sound quality at a manageable size. Tip for PC users: Make sure that the sample rate and bit depth microphone settings, found in the sound control panel of the computer, match with the sample rate and bit depth selected in your software. The display does not illuminate Make sure that the MV51 is fully plugged in. Audio is too low Check the computer sound control panel settings. When first connecting the MV51 to your computer, make sure to raise the computer volume level. Audio sounds bad Check the sound control panel of the computer to ensure that the MV51 is fully plugged in and recognized. Audio is distorted Use the audio meter to ensure that volume peaks are within the target range. If level is reaching the red peak indicator of the input meter, turn the gain down. Audio sounds unnatural or jittery Make sure that the sample rate and bit depth microphone settings, found in the sound control panel of the computer, are consistent with the sample rate and bit depth selected in your software. MV51 is plugged in, but the volume meter does not register a signal. Edit the privacy setting for the iOS device under SETTINGS > PRIVACY > MICROPHONE to give the recording application permission to use the microphone. Device not working with USB hub. The MV51 requires 250 mA per port. Check USB hub documentation for current/port specification. Mac and Lightning are registered trademarks of Apple Inc.